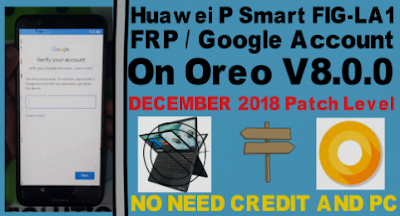 Huawei P Smart FIG-LA1 FRP / Google Account On Oreo V8.0.0 DECEMBER 2018 Patch Level. BYPASS Huawei P Smart FIG-LA1 FRP Lock Required File. BYPASS Huawei P Smart FIG-LA1 FRP Lock Method. 2# Put sd card and copy Quick Shortcut Maker Apk on sd card. 3# Open Talkback like video. 4# Go to talkback setting. 5# Now disable talkback same time click volume up and down. 6# Go to Help and Feedback. 8# Play video and click share tab. 10# Login microsoft account like video. 11# Click take to me gmail. 12# Go to setting then open manage account. 13# Open account now your phone setting open it. 14# Go to stroge then open sd card then install quickshartcut maker apk file. 15# Install and open it. 17# Go to setting and enable oem unlock. 18# Now reset your phone. 19# Take a time in reset your phone. 20# Now your frp lock remove complite.ready to used.